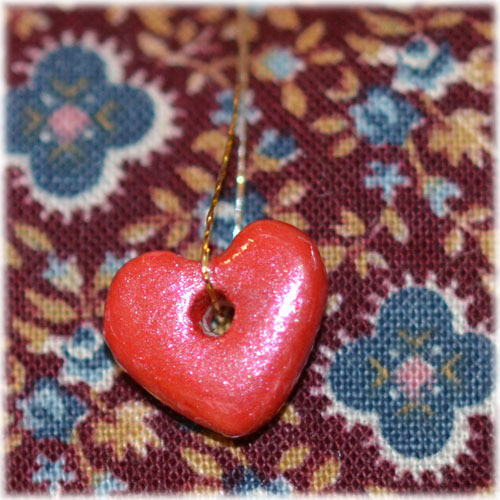 You can decorate this with any number of things, I happened to have a Sculpey heart I had in my bead box and some beads that I wanted to use. The fabric is from a large piece I have had for probably 25 years. I think I bought it to make placemats, but I’m not honestly sure I recall. I never did use it, but it’s really pretty and it shouldn’t go to waste. 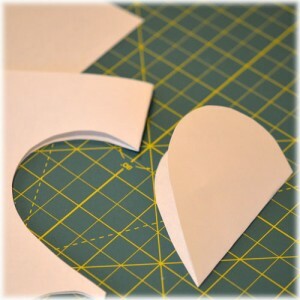 First, make a template so you can cut 2 heart shapes out of your fabric. The easiest way to do this is to fold the paper in half and cut half of a heart. Make sure to cut away from the fold. When you open it you should have a perfectly symmetrical heart. Next, fold a double layer of fabric in half, just like you did with the paper (but with two layers of fabric). 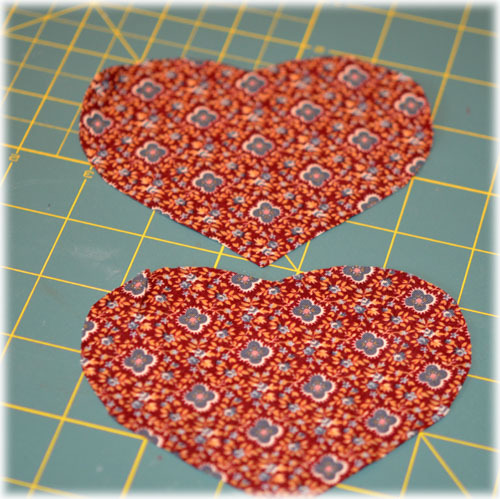 Place the heart template over the fabric, making sure to also cut away from the fold, so that when you open the fabric you will have 2 identical hearts. 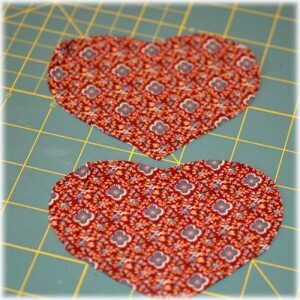 If your fabric is too thick you can cut the hearts separately, just be careful to make them the same or very close. 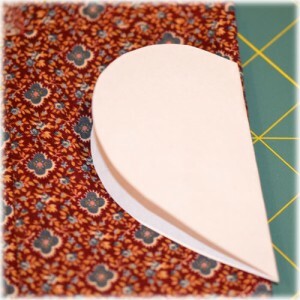 Or you could open the heart up and cut two thicknesses of fabric without folding the heart. Whichever works best for you. Be sure to save your heart template to use later to make more hearts! Next, take your two fabric hearts and place them with the right sides facing each other. Using your machine, stitch around the heart, from the point but leave an opening large enough to stuff it. Go ahead and turn the heart right side and stuff it and set it aside. 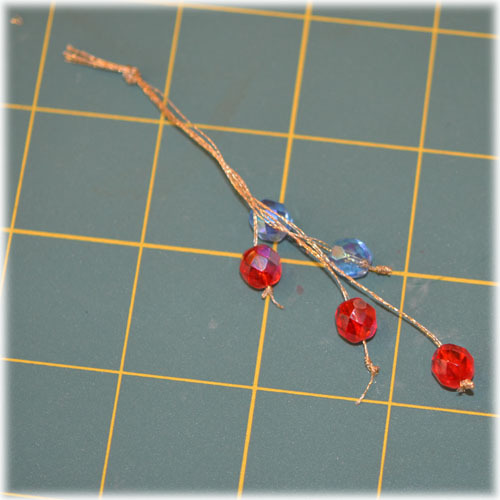 Next string 5 or 6 beads onto pieces of thread. I used two different colors of beads that matched the colors in the fabric, but it was just a coincidence that I happened to have those colors. 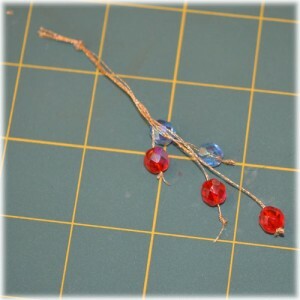 Knot the thread at the bottom so each bead will not fall off. Be sure to make BIG knots! Then arrange the beads at random heights. Make sure none of the beads are at the same height. Then tie the threads together at the top. Trim the thread so that it’s even. 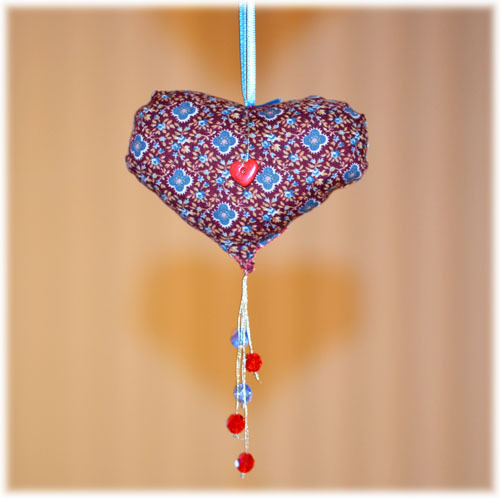 Stick the tied together threads into the open end of the heart and hand stitch the opening closed, neatly. Be careful that you not only do this as neatly as possible, but also that you close it up so that the threads won’t come out. I just made sure I stitched it very securely. If you want to stitch a button on the front, you can do so now (I think one on each side stitched straight through would be really cute!). Unfortunately my heart had only one hole, so I had to secure it with a piece of the metallic thread looped through the hole that I then stitched up near the top of the heart. You could also use some sort of charm, and attach it like this, maybe a cross or something. Or, make a little Sculpey clay creation like I did! The possibilities are endless! The last thing I did was attach a small loop at the top with thin ribbon, so it could be hung. I simply made a loop and stitched it on. I think if I had planned better, maybe I could have sewn it in when I was sewing it up. But I think it looks fine this way too. All in all, it was really quick and easy. It would be a fun way to use up extra fabric and notions. Also a simple project for a beginner. I wish I had thought to fill it with something scented and making it into a sachet. That’s my next project! this is so lovely, thanks for sharing this idea.